Need more information about booking Home 7257031 ? After reviewing over 170 properties we chose Away for the stunning fireplace, views and space. Our expectations were high and were totally exceeded by the actual experience of staying at Away. It is an amazing property! From the first moment of opening the doors into the breathtakingly beautiful living and dining area with incredible views over the mountain and valley we were in heaven. Away is in a quiet and peaceful location surrounded by rolling green hills, has its own little orchard and herb garden which were available for guests to enjoy. The owners have ensured that the house is very well appointed with a fabulous, large kitchen that has everything. We prepared a five course degustation for my mothers 70th birthday and found everything we needed. The main fireplace is gorgeous and provides the perfect place to gather around. The balcony is beautiful with views to die for and a fantastic, enormous BBQ. The house is well designed to accomodate extended families or groups of friends in two separate wings, each with bathrooms to give everyone a bit of space. I could go on for hours about this property. We absolutely loved it! Thank you Ross, the kind and thoughtful owner who turned a special occasion for our family into something utterly magnificent. We cannot wait to visit again. My only hesitation in writing this review is sharing the discovery of something very special and I only hope it will be available when we book again after more people discover this treasure! 'Away' is a spacious and elegant home, set high on the slope of Berry Mountain that was designed to complement the sweeping outdoor panorama that surrounds it. The house is fully equipped, including linen and towels to accommodate eight people so all you need bring is your favourite wine and a good book. It was Away that Sydney Magazine chose to feature at their launch. Kendall Hill wrote, "The view is captivating, while indulgent accommodation awaits indoors." You can read the complete article on the Away website. The house has two separate wings, positioned well apart that come together in a single, large, open plan kitchen & living area that faces north and provides sweeping views towards Ulrich's Pass and Budderoo National Park. The two wing concept allows you to enjoy your family or the company of friends yet to lose yourself in your own, private space. There is a bathroom in each wing with large cast iron bathtubs where an average person can lie full-length and experience the softness of a pure rainwater bath. The open plan area features a spacious and fully equipped kitchen, dining table for eight and a three, two and single seat sofa, arrayed in front of the open, wood burning fireplace. The heart of the house is the open fireplace where the two of you can curl up together and share those memorable, intimate moments or around which a group of good friends could gather with a glass of red wine and chat away till the early hours of the morning. There is an additional wood fired stove that can turn the whole kitchen and open living area toasty warm and guests often pull up the high-back stools and sit around it. It's one of those fun, impromptu gathering points in a house. There are four bedrooms, three of which have queen size beds. The fourth has two single beds that can be made up as a king size if required. The north bedroom has two corner windows that allow you to wake up in the morning and take in the changing moods of the valley. In the night if you leave the blinds open moonlight will stream in. The South bedroom is my favourite; it has a high post bed, very firm and comfortable and at night you will be lulled to sleep by the sound of the stream that flows through the middle of the property. The theme of spaciousness continues with the high cathedral ceiling over the kitchen/living area and into the bathrooms which are large as are the shower recesses and cast iron baths. There is a modern, 4 burner barbecue ideal for entertaining on the deck which is elevated and gives you the sense of being in the view and a part of the forest surroundings. If you bring a little native birdseed you'll be delighted at the sorts of birds that might join you for lunch. Away is a truly inspirational location. Youll experience the many, changing moods of the valley; thick cream, white fogs linger in the early morning and dissipate before lunchtime. Clouds rise over the ridges and change colours with the sunset. They race overhead with the strong winds and cascade over the mountains like a misty waterfall. Sunset strikes the escarpment behind the house which glows orange in the clear afternoon light. Wildlife abounds. In the morning there are a myriad of bird cries and strikingly coloured parrots fly on to the railing of the deck. Black Cockatoos often float overhead, their cry unique and Kookaburras abound. Echidnas are common and in the nights wombats forage about close to the house. You will be able to watch the moon rise over the mountains and the most remarkable of all is the stars. You have never seen stars until you see them at Away. High up on the mountain and with no other source of light, stars seem to burn a hole in the night sky and you will see the complete Milky Way. 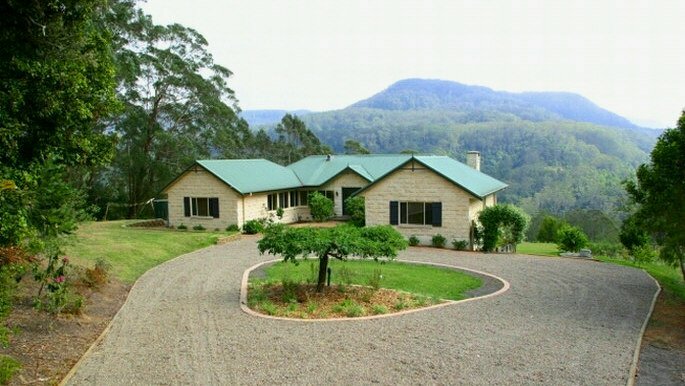 At Away you will feel a million miles from everything in a pristine bushland setting with peace and quiet and abundance of wildlife but in reality you are 12 minutes to the township of Berry- a charming little hamlet with lots of interesting shops to browse and cafes and eateries as good as any in Sydney. It's the quiet you will notice as soon as you arrive; a quiet that you never experience in a big city and a quiet that you probably haven't experienced in some time. You will start to relax as soon as you step out of your car. Away is well positioned to take advantage of all that the surrounding Shoalhaven district has to offer. You can be on picturesque Seven Mile Beach in 20 minutes and the journey is a straight road through beautiful countryside; no traffic and no parking headaches when you arrive. You can pack a picnic lunch, grab a beach umbrella and spend the morning on the beach with your friends or family then return to tranquil, cool summer evenings on your private deck. The most famous walk in Berry to the Drawing Room Rocks lookout is 10 minutes up the road and if you want to go a little further afield, within a short drive you will reach the picturesque town of Kangaroo Valley, Fitzroy Falls and the new Sky Walk at Jamberoo to name but a few. There are brochures and maps at the house to help you plan your outings and we are always available to give our guests some local knowledge on lesser known beautiful places to visit. We are not on site but we are available by phone and email and we have a caretaker nearby if you need onsite assistance.